Our brand new tests of riser recliner chairs have discovered three top-scoring models that qualify for Which? Best Buy status. The best riser recliner chairs help you sit down effortlessly, bring you to a standing position confidently and make you feel secure as you change position. Using a simple handheld control, they also enable you to adjust the position of the seat, back and footrest with ease. To see which riser recliner chairs topped our tests, head to our Best Buy riser recliner chairs. If you’re not already a Which? member, get instant access to these reviews by taking out a £1 trial to Which?. In a Which? first, we’ve tested and rated popular models of riser recliner chairs, from UK brands such as Sherbourne, Royams, Celebrity and HSL. We discovered that the best riser recliner chairs score highly in three important areas: comfort, security and ease of use. With supportive padding and good legrests, they offer comfortable sit and recline positions. The seat moves efficiently so that you are not left in limbo for too long – enhancing your sense of safety as you transition from sitting to standing, or back to full recline. The best chairs also have simple handheld controls that allow you to adjust the position of the chair’s seat, back and footrest easily. While our Best Buys cost more than £1,000, they deliver in these important areas. 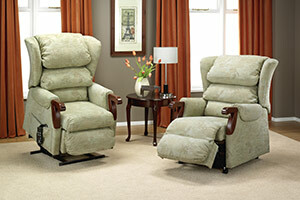 Our reviews of riser recliner chairs are part of a brand new section on our website called Staying independent at home. It’s packed with product reviews and advice to help you live independently at home, and it includes reviews of mobility scooters, easy to use home and technology products, such as washing machines, vacuum cleaners, TVs and laptops, plus stairlifts, bath aids, healthy eating and hearing aid providers.